We at Lumident specialize in creating beautiful and healthy smiles, with a strong commitment to understanding each patient's needs. We offer orthodontic treatment for children, adolescents and adults, and we utilize the latest technological advances in the dental industry. 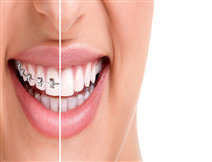 These include self-ligating braces, aesthetic braces, microimplant screws, Invisalign® and Clear Aligner®,along with modern digital diagnosis methods that ensure an excellent quality of care. Why should we treat primary teeth?